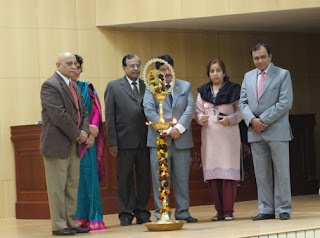 Amity Law School, Noida organized a workshop on Legal Entrepreneurship, initiated by the Ministry of Corporate Affairs on 26th February, 2013. The workshop was held to spread awareness among the students about investor protection measures in the financial markets, and to generate their interest in the field of taxation laws' practice. Mr. Sandeep Ahuja was the guest speaker for the occasion and threw light on various provisions of the Direct Tax Laws, focusing on the scope of practice available in the field of direct taxation. 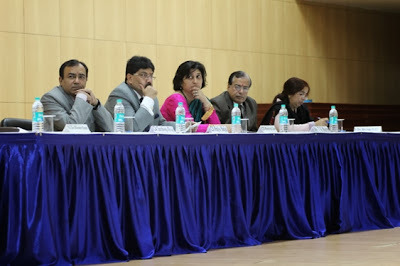 He also answered queries related to investments and tax planning options available in the Income Tax laws. Mr. Rajiv Bajaj, CFO of Panasonic AVC Networks India Co. Ltd. also spoke on the occasion about the various modes of raising finance in the Indian financial markets.